Un equipo de arqueólogos holandeses ha descubierto una tumba del portador del escudo del faraón Akhenatón, decorada con pinturas que incluyen escenas de monos que recogen y comen frutas, según desvelaron el miércoles autoridades de antigüedades egipcias. La tumba pertenecía al funcionario llamado Ptah Am Waya, y fue descubierta durante una excavación del equipo holandés en el área de Saqqara, la necrópolis de la ciudad de Menfis, informó la agencia de noticias estatal MENA, que citó a Zahi Hawass, titular del organismo sobre antigüedades. Akenatón, faraón de la decimoctava dinastía, que gobernó Egipto entre 1379 y 1362 a.C., abandonó la mayoría de los dioses antiguos e intentó imponer una religión monoteísta basada en el culto a Atón, el disco solar. Construyó una nueva capital llamada Ajetatón, en Tell el Amarna, 250 kilómetros al sur de El Cairo, y el hallazgo demuestra que altas autoridades continuaban construyendo sus tumbas en Menfis, cerca de la capital egipcia. "Es uno de los hallazgos más importantes en el área de Saqqara, porque se remonta al período de Akhenatón", dijo Hawass, según MENA. Las autoridades observaron que la tumba tenía paredes de piedra caliza con pinturas de escenas de la vida cotidiana y de Ptah Am Waya recibiendo ofrendas, informó MENA. "Algunas de las escenas más graciosas (...) son las de varios monos recogiendo y comiendo fruta", dijo Osama el Sheemi, responsable de las antigüedades de Saqqara, de acuerdo con MENA. El equipo holandés ha estado trabajando en Saqqara desde la década de 1990 para encontrar tumbas que daten del Nuevo Reino. Previamente, habían hallado la tumba de un sacerdote de la era de Akhenatón. CAIRO (AFP) - Dutch archaeologists have discovered a tomb in the Saqqara necropolis from the time of Egypts monotheistic pharaoh Akhenaton some 3,300 years ago, the Supreme Council of Antiquities has said. The discovery shows that notables contemporary with Akhenaton continued to be buried in Saqqara, just outside the modern day capital of Cairo, indicating the enduring importance of old religious orthodoxy under "the heretic pharaoh". "The discovery confirms the existence of tombs from important men of state during the time of pharaoh Akhenaton after the same delegation found another tomb from this period several years before," said SCA head Zahi Hawass, who described it as one of the "most important" discoveries in the area. Pharaoh Akhenaton of the 18th dynasty broke with millennia of ancient Egyptian tradition by insisting on the worship of one god, Aton the sun, instead of many, and left Egypts traditional capital to build a new city dedicated to solar worship at Tel Amarna. The tomb, which bears the royal cartouche for "Ptah Am Waya" is covered with wall paintings done in the realistic style of the period when classic artistic conventions were abandoned. The wall paintings include those of "Ptah" going to the afterlife as well scenes of daily life, such as monkeys eating dates. The Dutch team has been working in Saqqara since the 1990s, and focuses on New Kingdom tombs, particularly those from Akhenaton. Previously they discovered the tomb of the Akhenaton-era priest Meri Neet. "A tomb dating back to the era of King Akhenation in Pharaonic Egypt had been discovered" Minister of Culture Farouq Hosni carried the good news Wednesday. 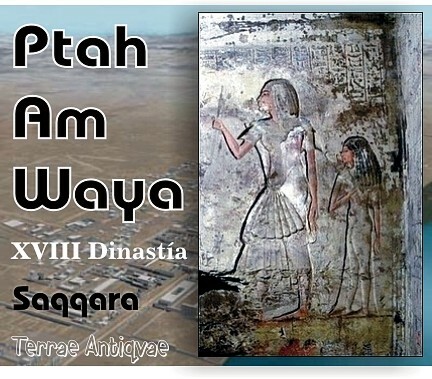 The tomb belongs to the holder of the divine seal, "Ptah Om Waya", said Secretary General of the Supreme Council of Antiquities Dr. Zahi Hawwas, noting that it was the most important discovery in the area of Saqqarah. A Dutch mission unearthed the tomb in excavations around Saqqarah, Dr. Hawwas added. He made it clear that recent discoveries in the area "made us know for sure tombs of state seniors during Akhenatons reign existed". Born Amenhotep IV, AKhenaton (1372-1355 BC) belongs to the 18th dynasty, a period boasting powerful kings and queens. Sabri Abdel-Aziz, the head of Pharaonic Monuments Department said the adobe tomb has an open yard and is surrounded by columns. It has three compartments and limestone walls with scenes representing the deceased and the offerings presented to him. The Dutch mission has been working in Saqqarah since the 1990s with the aim of finding tombs of the modern dynasty. 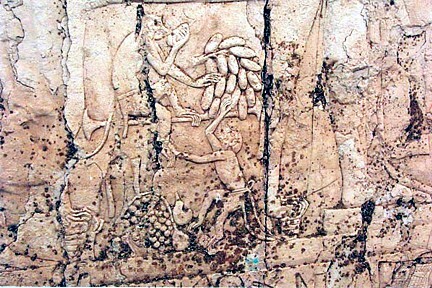 Photo: A relief featuring two monkeys playing beneath the chair of the tomb owners wife. To the west of the Serapium, during routine excavations, the Japanese mission from Wasida University discovered five Middle Kingdom shaft-tombs. Removing the sand from one of them they uncovered four splendid painted wooden sarcophagi, the first a "black type" anthropoid sarcophagus with yellow lines and scenes featuring the four sons of Horus decorating two sides. Zahi Hawass, secretary-general of the Supreme Council of Antiquities (SCA), said early studies suggest the sarcophagus belonged to Wiai, a New kingdom craftsmens chief of the house of Amun. "It probably dates from the 18th or early 19th Dynasty." The three others are Middle Kingdom rectangular painted sarcophagi with eye-panels and false doors, belonging to a Ka-Priest called Sebek-Hat and two mistresses of the house, Keki and Senet-It-Es. Sakuji Yoshimura, head of the Japanese mission, told Al-Ahram Weekly that the four sarcophagi were found intact and the three dating from the Middle Kingdom are decorated in a style typical of the 12th and 13th dynasties. The decorative scheme and hieroglyphic texts are also similar to those of the sarcophagus of Senu, unearthed two years ago in the same area. "Such similarity suggests that a sarcophagi workshop specialised in this style of decoration may well have existed in Memphis during the Middle Kingdom," suggests Yoshimura. As a result of ongoing excavations in the area in recent years the distribution pattern of tombs in the Saqqara cemetery is becoming clearer. Middle Kingdom tombs seem to have a due north orientation and tend to be lined up in clusters. Shaft digging activities were resumed in the New Kingdom at least from the late 18th Dynasty, and continued throughout the 19th. "The majority of New Kingdom tombs have an east-west axis and were built in the available spaces between Middle Kingdom tombs," says Yoshimura. Meanwhile, deeper in the desert of Saqqara necropolis, on the eastern side of Meryneiths tomb, a mission from Leiden Museum and University has unearthed an Amarna tomb decorated with wall paintings. The tomb consists of an open courtyard surrounded by pillars and, to the west, three cult chapels. Limestone revetment has been preserved along both the courtyards north and east walls. According to Maarten J Raven, head of the mission, more relief panels may be hidden under the sand still covering the base of the other walls. The bases of three limestone papyrus columns and one fluted half-column already jut from the sand. Decorative inscriptions on the tomb walls indicate that it belonged to Ptahemwia, among whose titles are Greatly Praised of the Perfect God, Beloved of the Lord of the Two Lands and Akhenatens Seal-Bearer. The decoration, involving "lively scenes composed of relatively small human figures with peculiar proportions" as Raven wrote in his archaeological report, compare well with almost contemporary reliefs in the nearby tomb of Meryneith, which was likewise started during the early years of Akhenatens reign. The reliefs have retained many of their original colours though those on the east wall and the east part of the north wall remain unfinished. Inscriptions reveal that Ptahemwias wife Maya was the songstress of the god Amun. On the westernmost part of the tombs north wall the couple are depicted seated on chairs receiving offerings from two priests, with relatives standing behind the chairs or else depicted in a lower register. A relief featuring two monkeys playing beneath the chair of the tomb owners wife is, says Hawas, the most vivid depiction found inside the tomb. 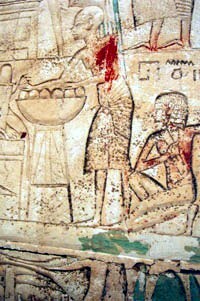 Scenes involving Ptahemwia are spread across the tombs walls. The most detailed shows Ptahemwia arriving home accompanied by his Nubian guards, charioteer and sandal-bearer. He is greeted by household officials while a servant gestures towards the open door of the house. Indoors, two attendants present a drinking vessel, a water flask and towel. Behind then are two female musicians, one of whom carries a lyre while upstairs his wife Maya is being poured a drink by another servant. To the right of the chariot waiting outside the house is a depiction of an agricultural scene. Raven believes the tomb will contribute much to our knowledge of Memphis during the Amarna period. Ptahemwia is already known from a pilaster panel in Bologna and a door jamb in the Egyptian Museum. Arqueólogos del Museo Nacional de la Antigüedad, ubicado en la ciudad holandesa de Leiden, han descubierto en Egipto una tumba de 3.300 años de antigüedad. De las inscripciones en ella se deduce que pertenece a Ptahemwia, "servidor de reyes, puro de manos", de la época del famoso faraón Akenatón (1353-1335 A.C.) "Podría decirse que era una especie de mayordomo del faraón, pero sería restarle importancia", dice Maarten Raven, dirigente del equipo holandés de excavación durante una entrevista en la capital egipcia, El Cairo. "En realidad se trataba de un alto cargo en la corte", afirma el especialista. El hallazgo tuvo lugar en Sakara, un cementerio de la entonces capital egipcia Menfis, la cual, según la tradición, fue fundada 3.000 años antes de Cristo por el rey Menes, el primer faraón del Egipto unificado. El cementerio, donde el equipo holandés realiza excavaciones desde 1975, está situado al sur de El Cairo. El Consejo Egipcio de la Antigüedad califica este hallazgo como el descubrimiento más importante en la región. "Estamos excavando aquí desde hace 33 años y, en este contexto, no es el principal hallazgo que hayamos hecho, pero sí proporciona información aclaratoria sobre legados en nuestro museo y en otros museos del mundo", informa Raven, quien también trabaja en la conservación de la colección egipcia del Museo de Leiden. En el siglo XIX se sacaron de Egipto un sinnúmero de objetos antiguos. "Entonces era una afición seria de muchos diplomáticos europeos", cuenta Raven. "Los destinaban tanto a sus colecciones privadas como al comercio. Ahora está prohibido pero, en ese entonces, era completamente legal". Muchas de esas piezas han llegado a museos en todo el mundo sin que se sepa la procedencia exacta. "En base a estos y otros hallazgos podemos determinar qué objetos específicos han pertenecido en algún momento a nuestra colección en Leiden", añade Raven. El equipo de arqueólogos conocía desde hace varios años la existencia de la tumba, pero antes de trabajar en ella, tenía que concluir los trabajos de restauración de otro hallazgo anterior. "Nos habíamos topado con el muro exterior durante la investigación en la tumba del sacerdote mayor Meryneith, del mismo periodo, que descubrimos en el año 2001", informa Raven. Los arqueólogos sólo pueden realizar excavaciones por siete semanas, durante el invierno europeo. Recién el próximo año el equipo descenderá a las cámaras mortuorias subterráneas. No obstante, Raven no espera hacer ningún descubrimiento espectacular, porque los profanadores de tumbas han dejado sus huellas. "Eso indica que probablemente en el siglo XIX ya había entrado gente en las tumbas, llevándose todo lo que tenía valor", dice Raven. "De todas formas, nos alegra mucho encontrar cualquier resto que hayan dejado". Según el jefe de la expedición, el nuevo hallazgo es menos espectacular que el del 2001. "Hay menos relieves y menos textos, pero la tumba que acabamos de descubrir significa un importante complemento a la información que ya tenemos". El complejo funerario, de forma rectangular (10,5 x 16 metros) semeja un templo aislado, con una portalada, un patio interior con columnatas, un foso que conduce a las cámaras fúnebres subterráneas y tres capillas. De la construcción superior del complejo sólo quedan en pie dos metros de los muros más pequeños. Raven califica de extraño el hecho que una parte de la tumba haya quedado sin acabar. "Quizás porque Ptahemwia falleciera prematuramente o porque hubiera caído en desgracia". Los paneles de relieve restantes contienen imágenes del propietario de la tumba, de su esposa Maia, sacerdotes, servidores y músicos, así como escenas de la vida cotidiana. Las representaciones, de un estilo artístico naturalista y experimental, son características de la época de Akenatón. Este faraón puso fin al culto politeísta y adoró a un solo dios, el Dios del Sol, Atón. De ahí que Akenatón sea considerado en Egipto como el fundador del monoteísmo, aunque después de su muerte, se rehabilitara la vieja religión y se regresara a un estilo artístico más formal. Hola, Jose Luis, me alegro de tus nuevas actualizaciones. Siempre me paso a echar un vistazo. Parece que en el Antiguo Egipto los funcionarios tenían "posibles", no como ahora que los funcionarios a trancas y barrancas podemos comprarnos un piso. Bueno, espero que antes que en monumentos funerarios (lagarto, lagarto) pueda gastármelo en viajes y placer!